Oriental Apartments in Sector-9 of Rohini celebrated the Independence Day this year with another freedom. This was the freedom from the burden of sending thousands of kilograms of solid waste to the already overflowing landfills in Delhi. In doing so, Oriental Apartments showed the way to other Resident Welfare Associations (RWAs) and colonies on what needs to be done to solve the ongoing waste management crisis in Delhi. Waste management is perhaps the greatest environmental challenge being faced by Delhi, yet one which is least discussed. The waste of Delhi has already created three giant mountains, taller than 80 feet in height, and these landfills have also become killer and are now coming down as landslides. There is thus a need for disruptive innovation in the waste management sector for addressing this very concerning challenge. Through the Zero Waste Initiative adopted up by Oriental Apartments, it is now on its way to becoming a Waste Neutral Colony. In fact, Oriental Apartments has already reduced its total solid waste load leaving the colony by 85%! And that is not all. By understanding the important role played by segregation, and ensuring that each and every household segregates their waste, they have also been able to augment the value of their waste thereby creating revenue and jobs. So how did Oriental Apartments make this possible? The Zero Waste Initiative adopted by Oriental Apartments became possible because of the vision and determination of the Oriental Apartments RWA President Mr. B.K. Bajpai, Secretary Mr. O.P. Talwar and other members of the RWA Association and in no less terms by the support and encouragement extended by other residents such as Dr. Arun Bhaskar and Mr. Krishnan. The Initiative was taken in collaboration with Scrapped, a company led by Mr. Rohit Aggarwal and working towards finding and implementing holistic solutions for solid waste management. In the first step, Scrapped interacted with the residents on the methods and processes they would be implementing, followed by urging the residents to maintain two dustbins, for dry and wet waste. The residents were assured that these would be religiously collected in a segregated manner. To do this, the local waste collector was engaged by Scrapped and was inducted into the Company. This way, a person who had worked all his life in the informal sector (of which we know so little) suddenly became an employee of a Company and came into the formal sector. This in itself was the first major achievement of this initiative. Formalizing the informal sector: A key strategy adopted by Scrapped. Scrapped subsequently also distributed bins to collect the dry and wet waste in a segregated manner. The Scrapped Scrapped model divides solid waste into four categories. These are 1) Recyclable, 2) Non-recyclables, 3) Organic waste and 4) Reject and Inert. Segregated waste collected by Scrapped staff from the residents is therefore often further segregated before it is finally processed. Some of this waste material, especially that which cannot be recycled, is sent to Pune for converting into poly-fuel. Waste bins given by Scrapped to residents for segregation of waste (left) and a resident in green action! For handling Organic Waste, Scrapped utilized the services of a contractor to create four above-ground compost pits, 3 x 3 x 4 feet in dimension. Each such pit can accommodate up to 1,000 kg of organic waste, which is converted to rich, organic manure in two to three weeks. Scrapped plans to distribute the organic manure to the residents and also sell the rest in the open market to meet the operational costs of the initiative. In this manner, each and every waste, including junk materials, being generated by the households of the Oriental Apartments is being tackled by Scrapped. Despite having other choices, Scrapped recruited a former rag picker to handle and manage the organic waste pit setup thereby adding to the Company’s social capital. Due to the holistic nature of this initiative, the Scrapped model has resonated well with the residents, who are readily segregating their waste, earning from selling their junk material and living a life of peace knowing that there waste is no longer adding another layer to the ever-increasing landfills of Delhi. At the same time, the operations and revenue model of the Company is also leading to the formalizing of the workers of the informal waste sector (including waste collectors, junk dealers and rag pickers), who have otherwise worked all their lives in fear and often without any dignity. 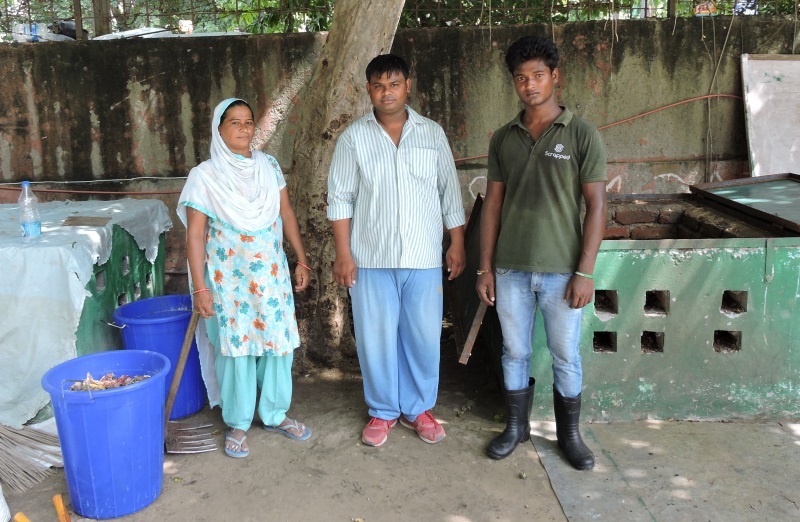 They are all now proud staff of a Company, which is a novel initiative towards making RWAs in Delhi waste neutral by providing a holistic waste management solution. Top image caption: Co-Founders and Staff of Scrapped.